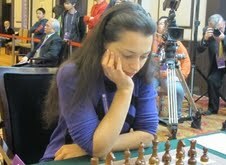 At the end of day 2 we have a clear leader - the Russian player Alexandra Kosteniuk. She won a hard fought game against Elisabeth Paehtz from Germany. There are two players just behind on 3 points: its the Ukrainian GM Katerina Lahno who defeated Monika Socko (POL), and Ju Wenjun (China), who won against Almira Skripchenko (FRA). The first seed, the Women's World champion Hou Yifan from China, drew again, this time with the black pieces against Elina Danielian (ARM) and is a full point behind the leader. Tomorrow we are expecting some great battles. Kosteniuk against Lahno and the two Chinese players playing each other. At the end of tomorrow we will know the Rapid champion. This round the sole leader, Wang Hao from China, faced the Russian player Alexander Grischuk,who was 0.5 point behind. They played quite carefully in the opening but in the endgame Wang noticed Grischuk's mistake and won the game, how lucky he was! In other games, the American player Gata Kamsky was the first winner of this round. He defeated Zoltan Almasi from Hungary. Another Chinese player Wang Yue was not as lucky as Wang Hao, he lost to the Cuban player Leinier Dominguez in a Sicilian defence. All other games ended in draws. So, to date, Chinese Wang Hao has an amazing 4 wins in this strong tournament! Elisabeth Paehtz from Germany, who is seeded 15th in this tournament, continued to make her fans happy. She won a complicated game against Pia Cramling (SWE) and caught up with Alexandra Kosteniuk. 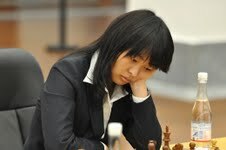 The game beetween the Russian former world champion and Ju Wenjun from China was equal and finished in a draw. Unfortunately, we have to mention that Viktorija Cmilyte from Lithuania, who might be one of the most popular chessplayers in the world, lost the 3rd game in a row. Anyway, she has 3 rounds more to improve the situation. The game between first seed Hou Yifan from China and second seed Anna Muzychuk (SLO) ended in a draw. "Life is beautiful!" - that, might be the thinking of the leader of the tournament Wang Hao from China. 3 wins - what a nice result after 3 rounds! The game between the Chinese player and Shakhriyar Mamedyarov (AZE) was solid but complicated. Hao showed his best in the endgame. His perfomance is great, but he still can't relax. 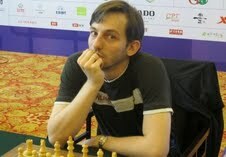 He is not totally alone - Alexander Grischuk (RUS) won against Vassily Ivanchuk and has scored 2,5 out of 3. So the next game between him and Wang Hao is really important. Also we need to mention Ruslan Ponomariov (UKR), who won an intresting game against Perez Leinier Dominguez (CUB) and has scored 2 points. The opening ceremony of 2011 SportAccord World Mind Games took place today and the Games are now officially open. The event took place in the Beijing International Convention Center. SportAccord President Hein Verbruggen expressed his gratitude for the warm reception of SportAccord in China’s Capital. He continued by acknowledging the General Sport Administration of China and Beijing Municipal Government for their support for SportAccord World Mind Games, the Local Organising Committee and all the people involved in the preparations. He acknowledged the official partners of SportAccord World Mind Games; Rado and Samsung. Deputy Major of Beijing Liu Jingmin, Deputy Director of General Administration of Sport of China Feng Jianzhong welcomed SportAccord, players, coaches, referees, and friends. They underlined the values and importance of SportAccord World Mind Games and wished the event a great success. The addresses were followed by cultural performances of a children’s chorus, Beijing Opera Group and Beijing Women New Folk Music Band. The sole leader of the women tournament is the former world champion GM Alexandra Kosteniuk from Russia, who is showing great form and has scored 2 out of 2. She played the game against GM Nana Dzagnidze from Georgia beating her with her special style: aggressive! GM Pia Cramling from Sweden made a comfortable draw against the World champion GM Hou Yifan from China. Now both are chasing the Russian chess player together with IM Elisabeth Paehtz (GER) and WGM Ju Wenjun (CHN), who made a draw in their game against each other. Another 2 rounds of the women competition will be held tomorrow. Both rapid tournaments consist of 7 rounds and promise great chess! Ju Wenjun: It’s a great honour to play here! 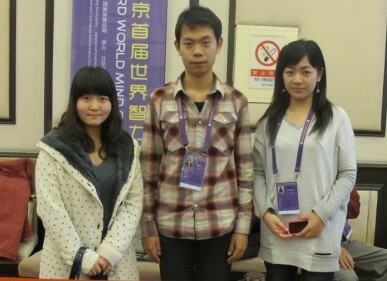 Ju Wenjun from China scored 1,5 out of 2 during the 1-st day of the women's rapid tournament. - What do you think about your participation in the Sport Accord World Mind Games? - I am looking forward to it. It’s the second time that I am playing here. In 2008 I tried just one section – blitz. And I did not play well. Now I hope to improve my performance. Rapid, blitz and blindfold are really different kinds of chess activity. So the players are able to show different sides of their talent. I hope that I shall play my best chess here. - Where do you prefer to play – in China or abroad? - At home, of course. A lot of competitions are in Europe, so the trip is long. Plus, the acclimatisation is not very easy sometimes. And I have a lot of friends in China who always support me during the tournament. - How do you consider 2011? - I had the honour to play in big tournaments against many famous opponents. I was invited to play here in the SportAccord World Mind Games. So, the year was successful. I had some great experiences. Sometimes I was lucky, sometimes not, but this experience will help my future career. 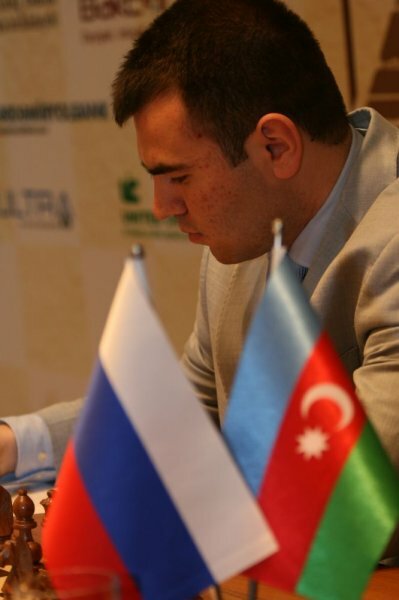 The game between two famous players – the Azeri Shahriyar Mamedyarov and Sergey Karyakin from Russia was probably the most dramatic and entertaining in this round. Shaki, as he is known among his friends, played aggressively and fearless as is his normal style. In one moment, he sacrificed a piece to be able to get to the opponents king. The idea was correct and Sergey had to play the position without a rook. But in one moment he could achieve a draw! Anyway everything finished happily for Mamedyarov, who becomes one of the leaders, for the time being, of the rapid tournament. Another leader is Wang Hao from China, who defeated Ruslan Ponomariov from Ukraine. GM Alexander Grischuk from Russia succeeded in winning against another chess legend, GM Gata Kamsky, with black pieces. GM Vassily Ivanchuk remained in close pursuit after his win against Lenier Dominguez form Cuba. Ivanchuk? Grisсhuk? Or, maybe, a dark horse? Welcome to SportAccord World Mind Games!